Spring Creek Correctional Center has a unique legal internal economy. The inmates run a prison store that sells food, hygiene items, and clothing. Profits from the store stay inside the facility and are divided up between nine different funds, including one that provides equipment for the hobby shop. Anthony Garcia sat at a long table facing the cement wall of the prison’s hobby shop, a rhythmic tapping filling the air. He was using an air-powered tool to engrave a piece of silver with tiny forget-me-not flowers. A small desk light shone on the intricate pattern. A shelf above his workstation held books on handicrafts and Mayan art and supply catalogs. Garcia has been – and will be – in prison for a long time. 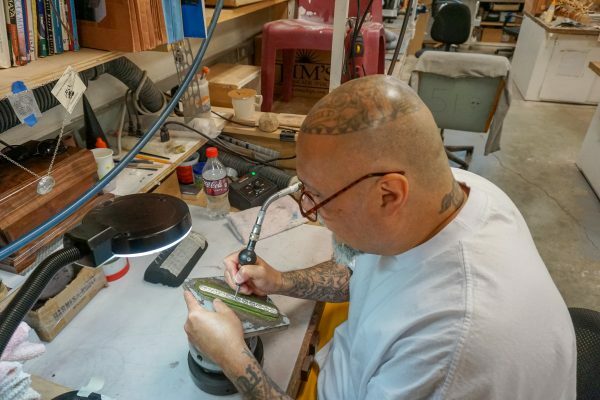 When he’s not in the hobby shop, he’s teaching classes on morals and ethics to other inmates, hoping they won’t end up in the same situation. 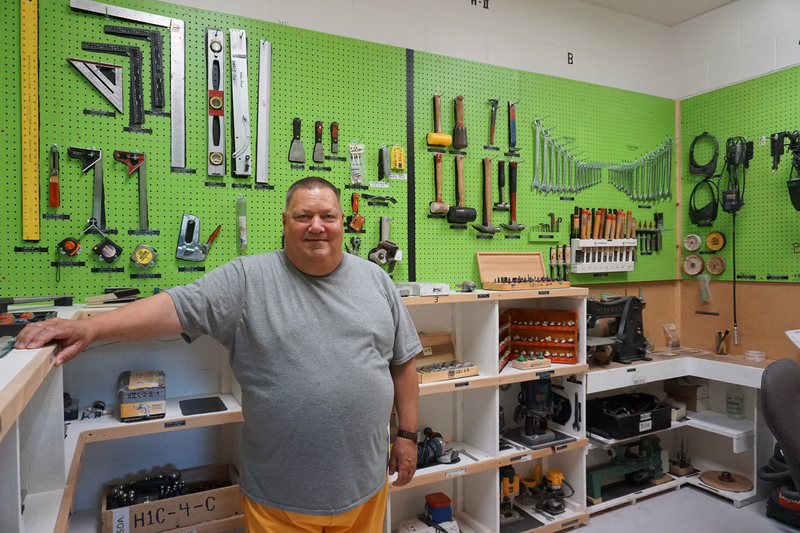 Garcia said being in the hobby shop helps him focus, and makes him some money. He sells his bracelets and carvings then reinvests it back into his work, buying his own silver, copper, and wood. But Garcia’s art isn’t as lucrative as it could be. 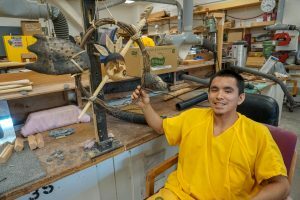 He first learned to carve ten years ago at Lemon Creek Correctional Center in Juneau, where an expert taught him to make paddles. 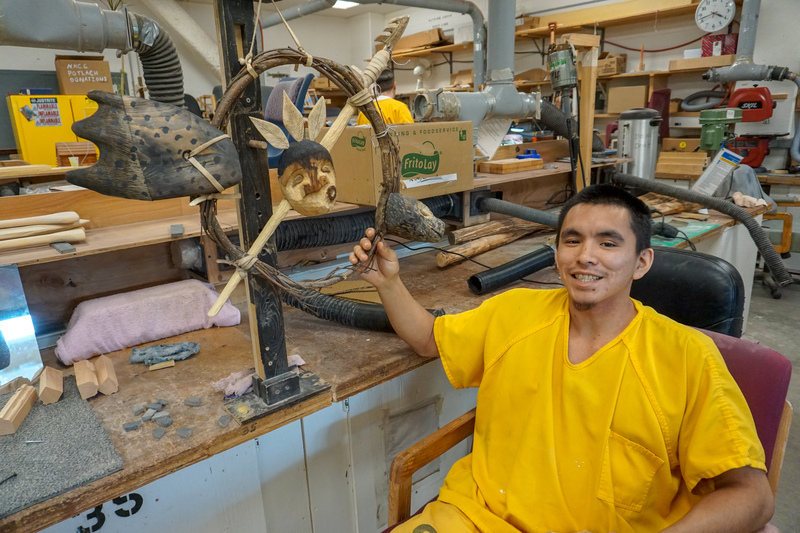 He shows off a long piece of yellow cedar engraved with a beaver and a welcoming hand sign. “I was getting $500 a paddle in Juneau and up here, I’m lucky if I can get $200,” he said. 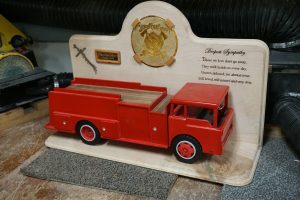 There are a limited number of ways the inmates can sell their work, Spring Creek superintendent Bill Lapinskas said. Some mail it to their families who sell it for them on the outside. Others put it in a glass case by the visiting room and hope it will be purchased. Lapinskas said he allows inmates to sell to each other, too, through the shop. But Lapinskas said the market both inside and outside the prison is too small. Too many of the guys are making copper and silver bracelets. The problem is very common. Wendy Jason with the Prison Arts Coalition said it’s hard for prison artists across the country to sell their work. In some places it’s illegal, but rules vary by state and by institution. According to Jason, who has been working with the coalition for eight years, the guys at Spring Creek actually have it better than most because they have the support of the institution’s staff. Jason said people frequently contact her looking for advice on how to sell their work or the work of a loved one. She said some websites do market work for inmates, but the safest idea is for inmates to give it to people they trust and have them sell it for them. She also recommends that they not discuss the transactions over phones or by letter because communication is often monitored, and inmates have been punished for selling their work. Despite the risks, Jason said selling inmate art is valuable on many levels. 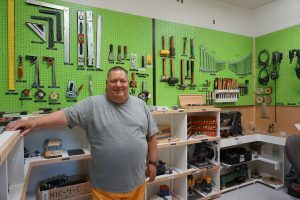 Lapinskas said he’s exploring options like setting up an Etsy shop or selling at fairs in Anchorage. In the meantime, many of the craftsmen are creating works to donate to local fundraising auctions in addition to trying to sell on their own. Because even if they can’t make money, they can still help others while they make art. Next week on the Solutions Desk we’ll head out of the prison and into a kitchen. Want to make sure you don’t miss it? Subscribe to the podcast on iTunes, Stitcher, or NPR.